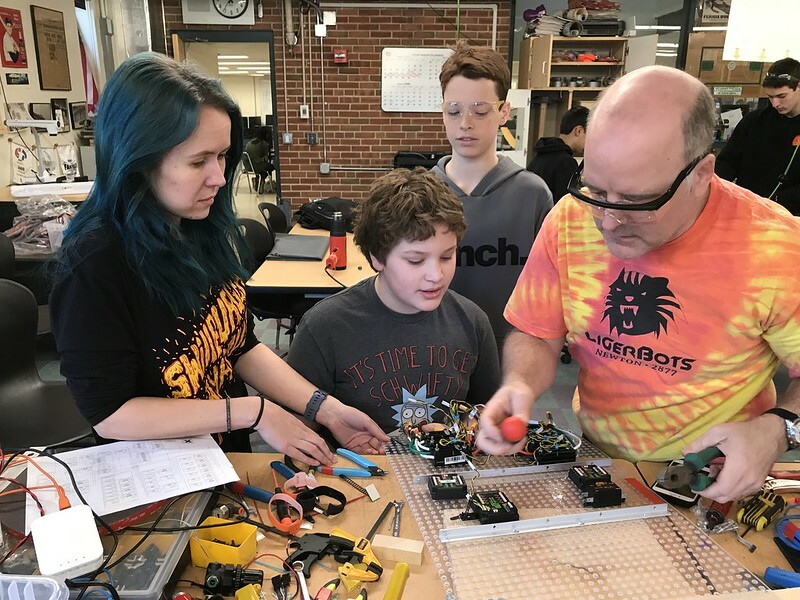 LigerBots Blog - We're Putting Together the Robot! We’re Putting Together the Robot! 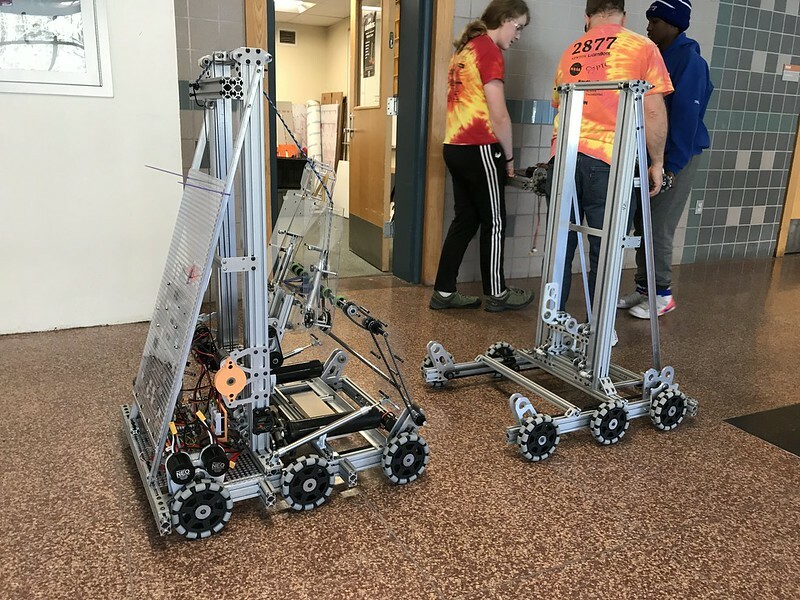 This was the fifth week of our six-week build season, and that means that the LigerBots are in a time crunch. 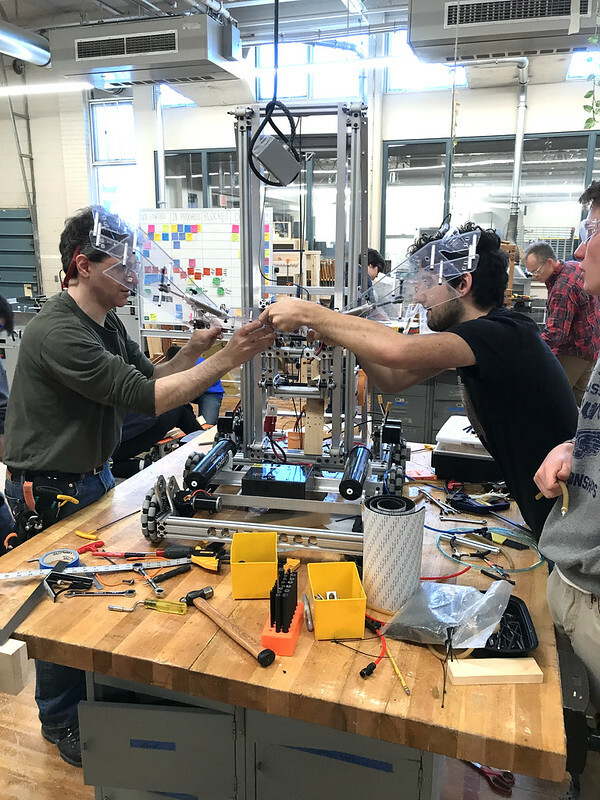 Because we have improved our design processes and our ability to manufacture complex parts over the past few years, we are able to include parts we could previously only dream of putting on our robot. But it now takes longer to get to the point of actually assembling the robot than it did a few years ago. We are busy for weeks, designing and making parts we know will work rather than attaching pieces hit-or-miss. Luckily, when we finally get to the point of assembly, the robot now comes together quickly. This week we started putting together all of the robot parts we have been manufacturing during the past month. We were lucky to have an early release day from school last Wednesday, which allowed us to put in extra time on the robot. Our robot now has an elevator, a “cargo” ball intake, and a claw that will place game pieces, plus wheels, motors, and pneumatics. 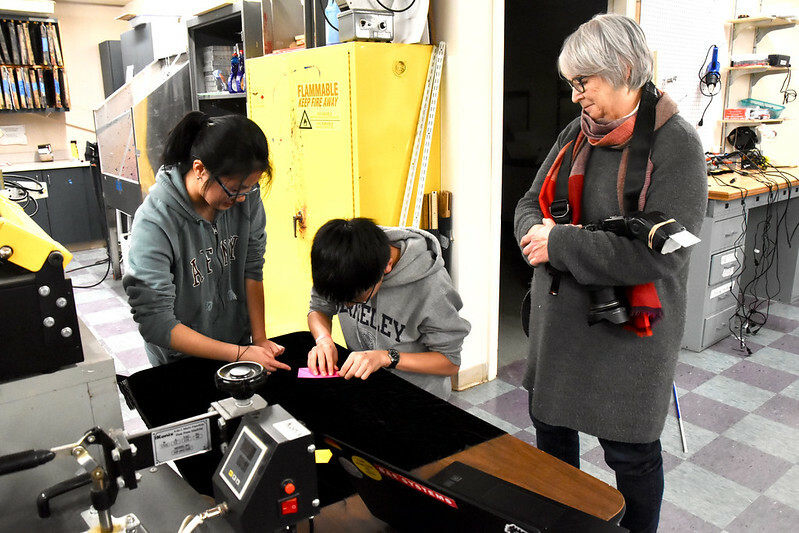 This week we cut lots of metal plates for our elevator and for various mounts, which enabled us to attach the electrical board, battery, pistons, camera, and rope for the elevator. 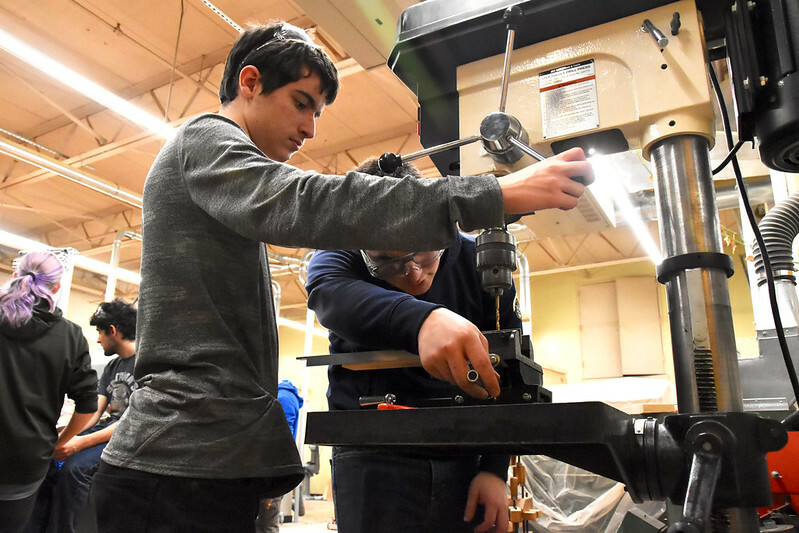 There were obstacles to overcome this week, as there always are during the robot build. We had trouble with the ball bouncing out of the robot before the claw could grab it so we added a bar to trap it in the claw. And, we had to replace and reposition the piston that kicks the ball out of the claw. 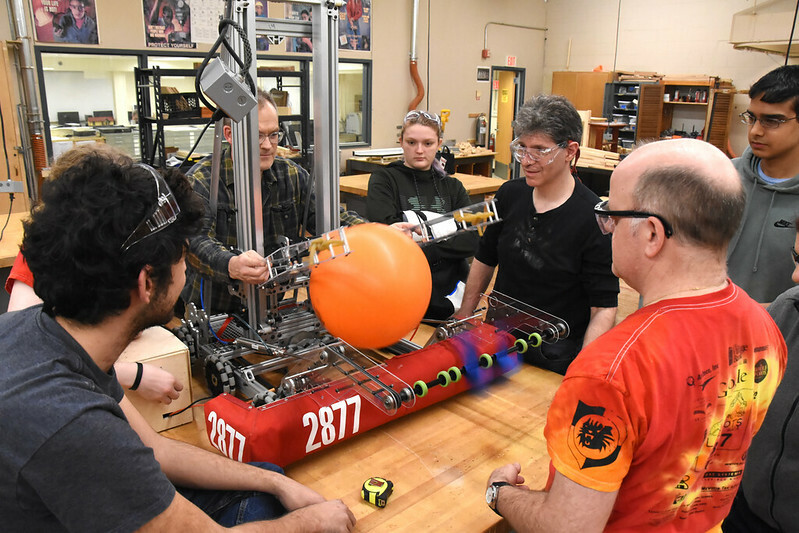 Figuring out we need a bar to trap the ball–the “cargo” ball bounces right out! What we don’t have yet are wired electronics and a mounted camera to acquire images for our robot vision system. Next week we hope to have this camera and software in place so that our driver can “see” where the robot is and control it during the “sandstorm” period of this year’s competitions, when an opaque curtain is lowered between the drivers and the playing field for fifteen seconds. The vision system will also allow our robot to automatically align to its targets during all phases of competition. Until we wire the electrical board we have no computer control, and we have to move all the mechanisms around with our hands. We hope have to do a full integration test next week to see if everything will work together. Our newly-announced drive team is eager for us to finish so that they can start driving practice! 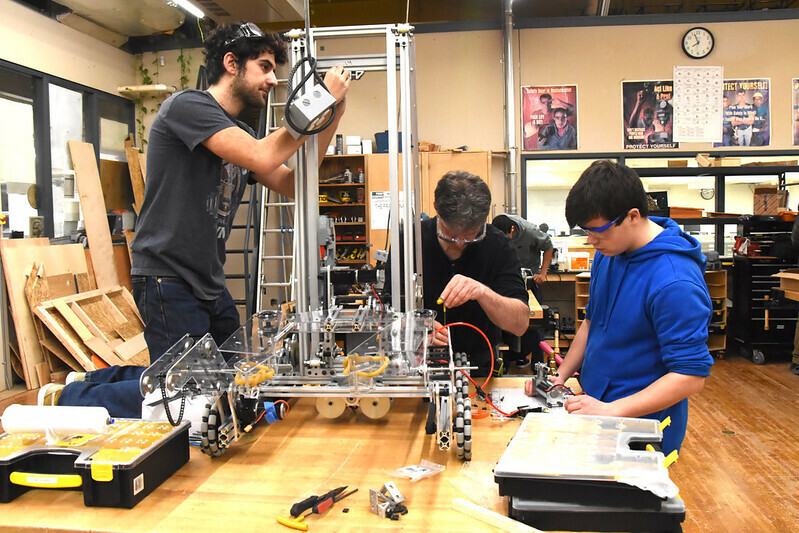 Thanks to generous funding from our donors and sponsors, we are continuing our practice of building two copies of our robot so we can tweak and improve the second one after the first one is sealed into its giant plastic bag at the end of the official build season. 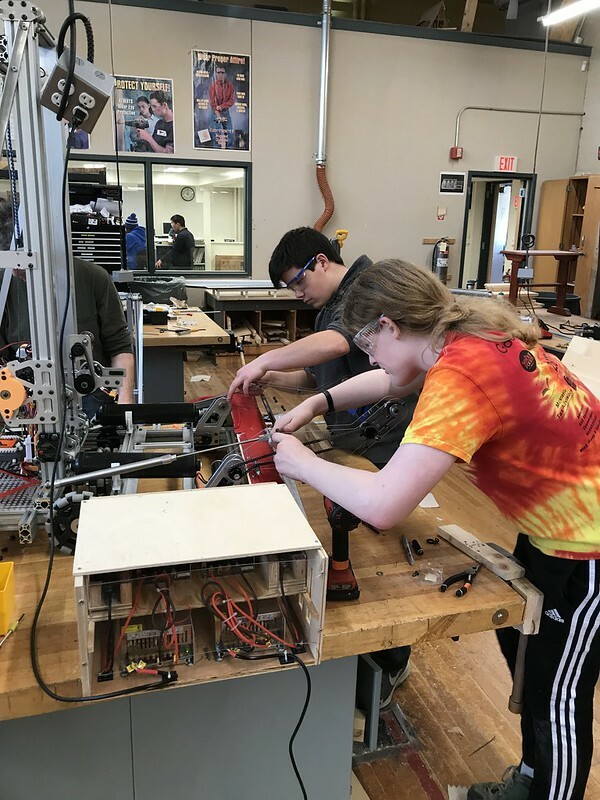 Since we’re allowed to keep 30 lbs of our 120 lb robot “out of the bag” and continue working on it until competition we have decided to make the intake and the claw mechanisms part of our “withholding allowance.” We will continue improving them right up until our first competition, the SE MA District Event at Raynham High School in Bridgewater, MA on March 9 and 10. We’ll have a few sanctioned hours before the competition to transfer our improved parts onto our competition robot. 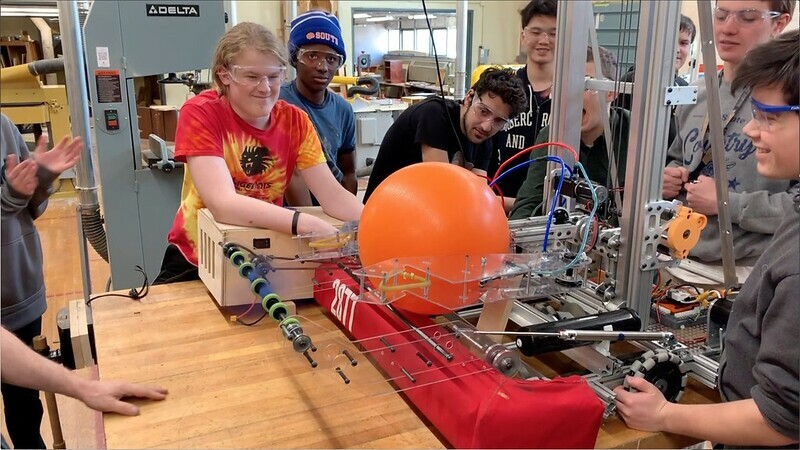 The LigerBots strategy council has finished its analysis of the offensive power rating (OPR) of all of the New England District FRC teams. 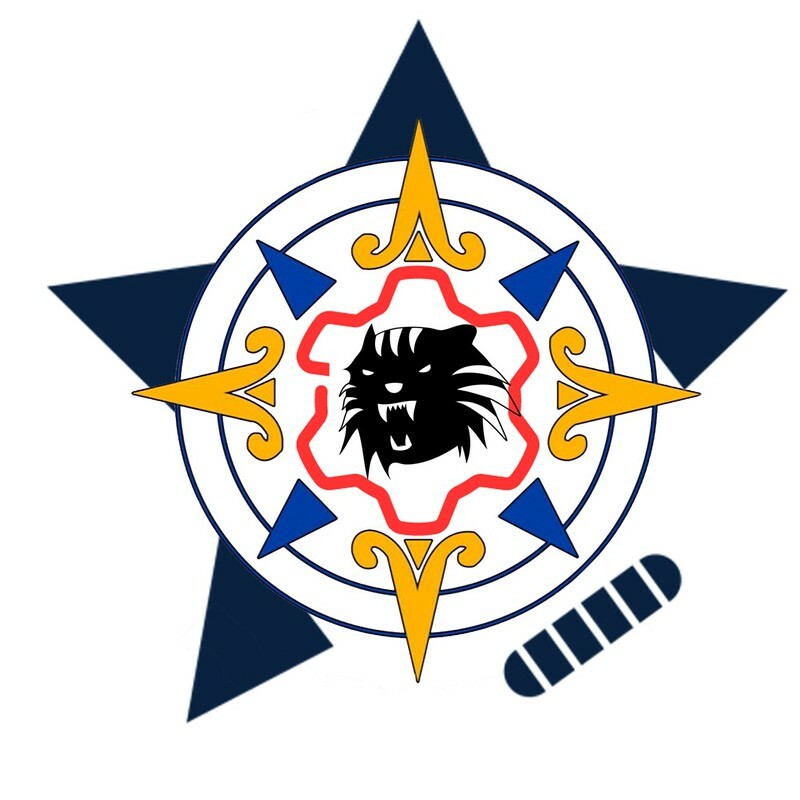 We also have created a scouting alliance with three other FRC teams to collaborate on collecting data about other teams and their robots’ performance during this year’s competitions. We use these data to improve our robot drive team’s game strategy, and to optimize our picks of alliance partners when we make it to tournament playoffs as an alliance captain. Our awards group has turned in our Chairman’s Award submission, and is now developing the oral presentation the group will give to judges at our competitions. 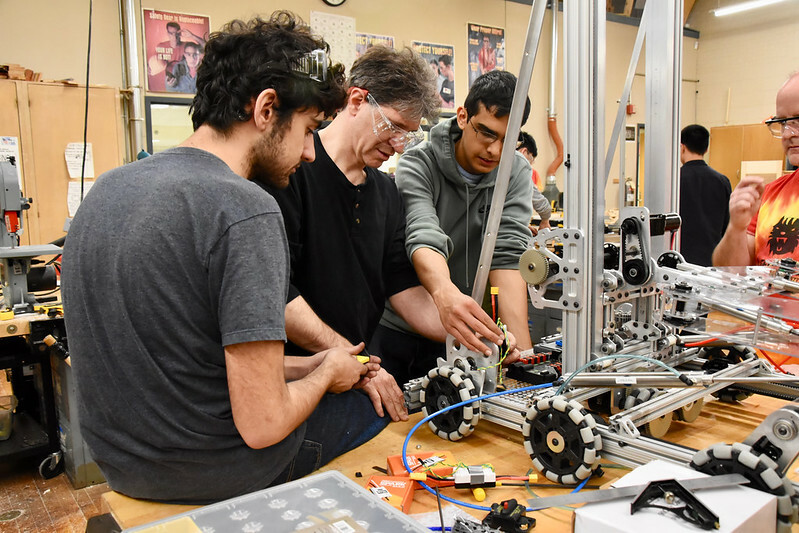 We do extensive preparation for this presentation because winning the Chairman’s award (given to the team that best exemplifies the values of FIRST Robotics,) would automatically move us to the next level of competition no matter how our robot performs. 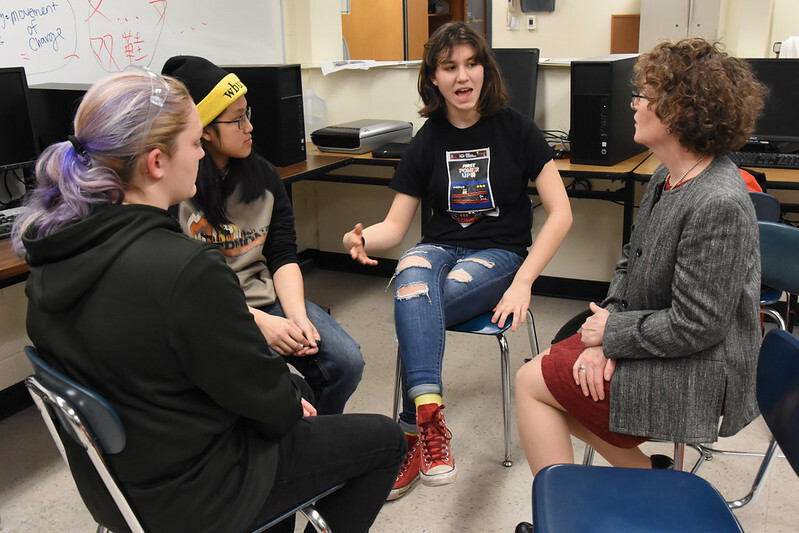 We have resumed training the entire team on talking to awards judges, other teams and potential sponsors thanks to the help of Elizabeth McVittie, a new mentor who’s an expert in finance and public speaking. The design of our robot repair-pit publicity banners is finished and we are working on the 50-page booklet about our team that we use at competitions and outreach events all year. 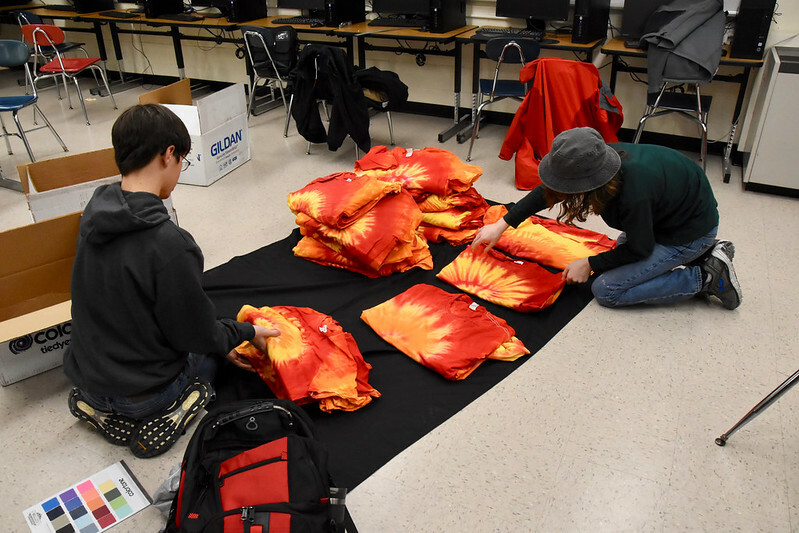 One-hundred-fifty blank tee shirts have been sent off to the graphics department at Newton North High School to be screen printed with this year’s team and sponsor logos. We’ve sure come a long way since kickoff. 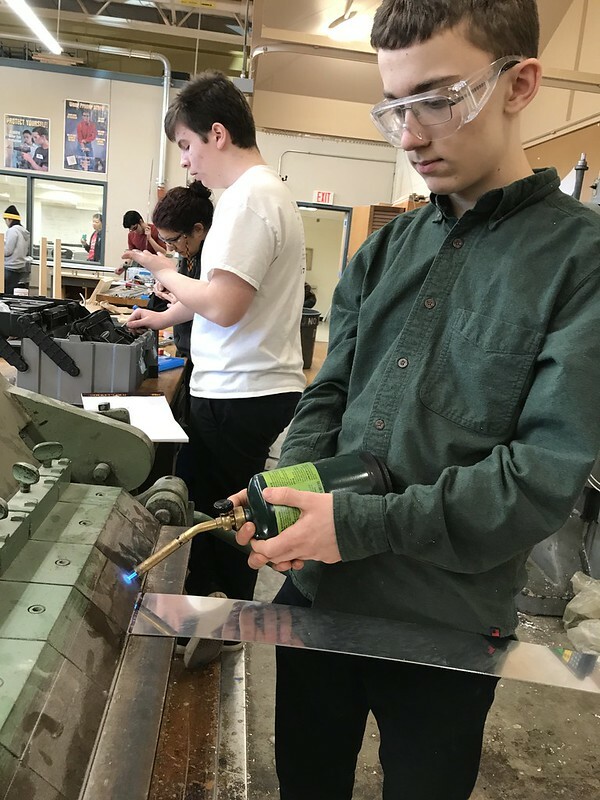 The entire workshop is in high gear in the runup to the end of build season, and we are looking forward to putting our robot, and ourselves, to the test at our first event. « Full Steam Ahead in Week 4!